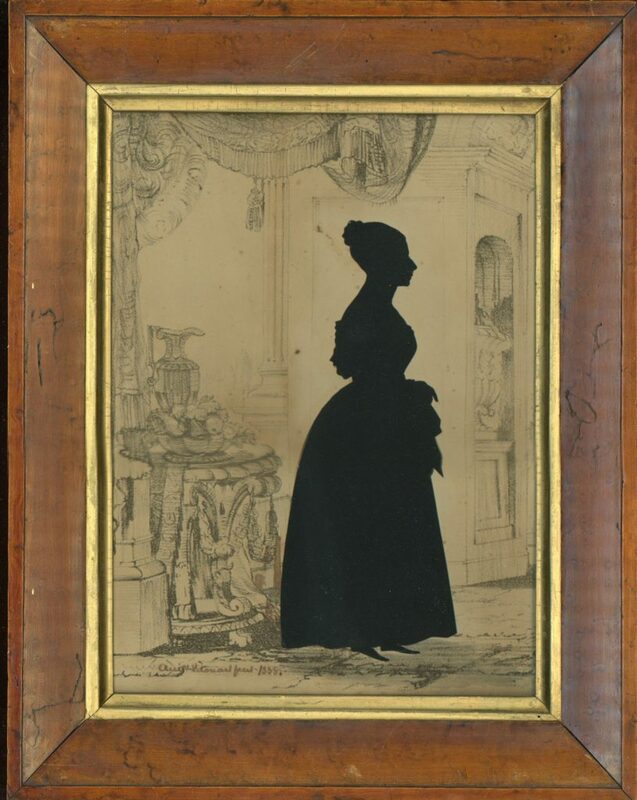 This silhouette showing an elegant lady is by the highly esteemed nineteenth century cutter, Augustin Edouart (1789-1861). The lady is depicted standing by an ornate side table bearing a ewer and a bowl of fruit in a classically decorated hallway with tasselled drapes and a large urn in an alcove. 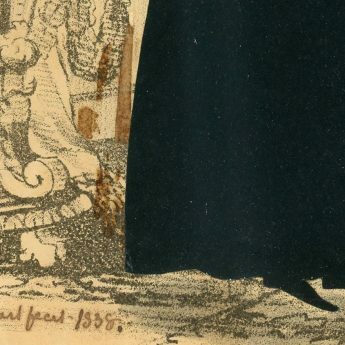 Holding a large handkerchief, the lady is wearing a wide-shouldered dress with flounced sleeves. Her hair is swept up in a plaited knot. 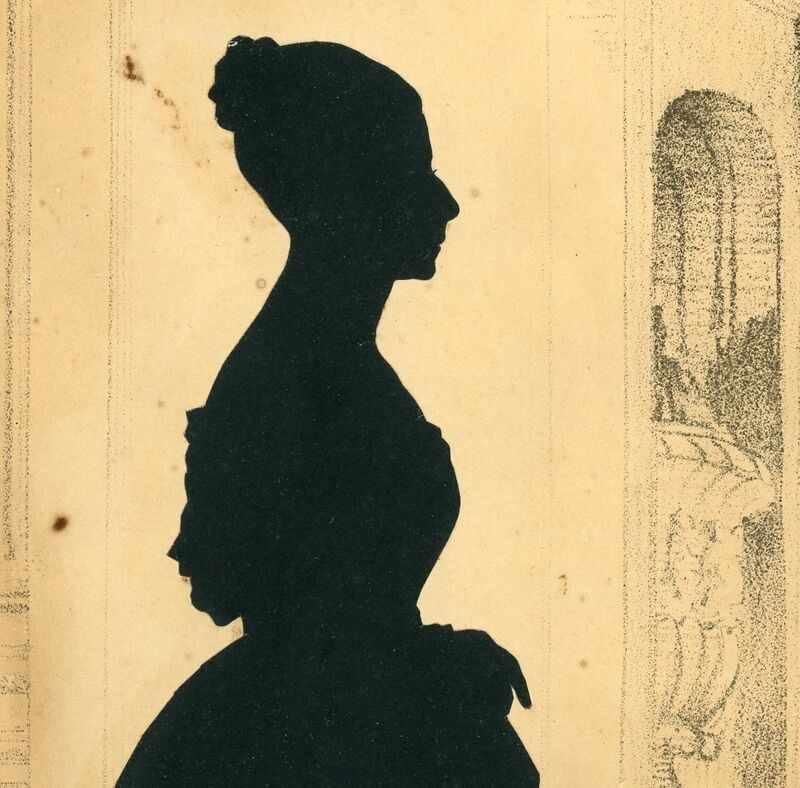 The silhouette is cut out and is set against a lithograph background. 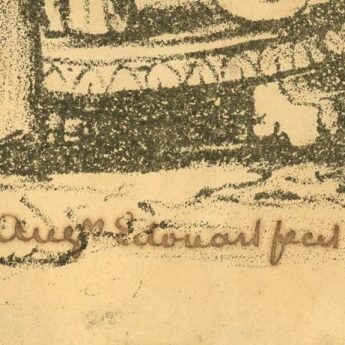 It is signed and dated on the obverse – ‘Augn Edouart fecit 1838’. During this year Edouart is known to have spent time in the Midlands, working in Leamington Spa and Birmingham, before crossing over to Belfast in September 1838. Regrettably the lady’s name has been lost to history. The silhouette is housed in the original bird’s eye maple veneer frame with a gilt slip as supplied by the artist at the time. The background card has an area of age-browning running vertically part way down the middle with a few scattered spots. 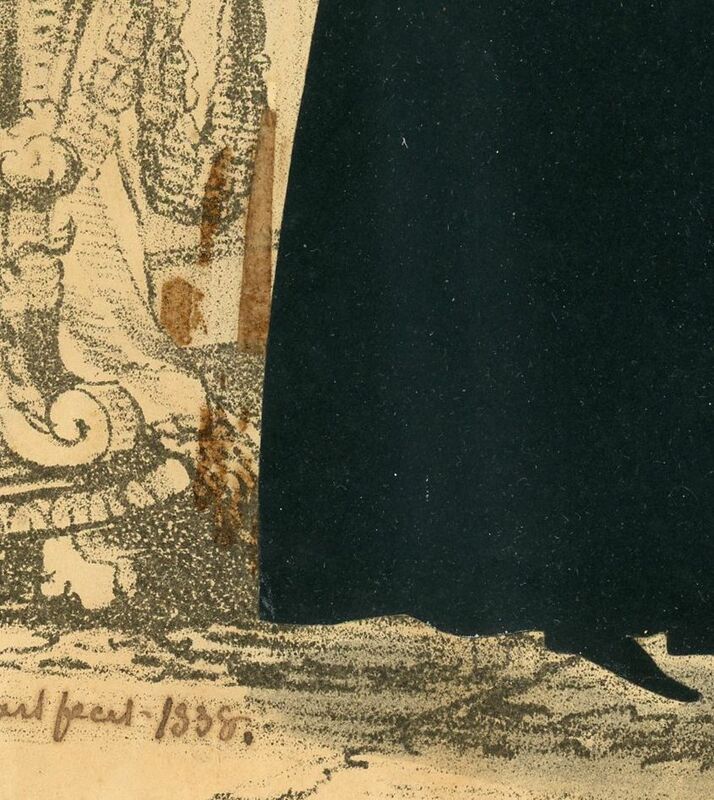 There is also an old gum mark visible to the side of the skirt. As an ex-Bonapartist claiming asylum in Britain, Augustin Edouart set himself up as a shopkeeper in Cheltenham specialising in French and fancy goods but unfortunately the enterprise was declared bankrupt in May 1826 and he needed to find an alternative way to support his family. Quite by chance he discovered, when challenged by a friend at a dinner-party, that he had a natural aptitude for cutting likenesses out of paper, so much so that he thereafter made a successful career of it. He toured extensively throughout the British Isles for several years cutting many thousands of profiles including well-known figures of the day, many of them authors, musicians, politicians and even royalty. In 1839 he set sail for America where he toured successfully for a decade before deciding to retire to his native France. He nearly didn’t make it though as his ship went down in a storm off Guernsey. Fortunately the passengers were all rescued but Edouart lost virtually the whole of his precious archive of work and the will to continue to work commercially thereafter.